The mobile music market might be focused on smartphones right now, but that doesn’t mean there’s no market for standalone portable media players…and to that end SanDisk has announced its new SanDisk Fuse+ MP3 Player, sporting a large color LCD display, video playback capability, microSDHC removable storage, and swipe-based “filmstrip” interface for selecting music and navigating player functions. And the Fuse+ is available in 4, 8, and 16 GB capacities at suggested prices of $79, $89, and $119, respectively. 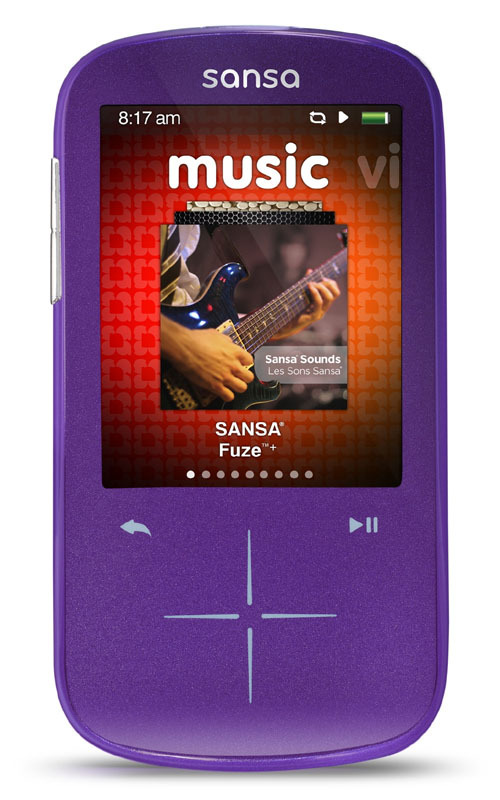 LIke most media players, the Fuse+ supports a variety of audio formats (including MP3, WMA, WAV, DRM-free AAC/M4A, FLAC, Ogg Vorbis, Audible, and Secure WMA), along with H.264, MPEG-4, WMV, and Flip Video video formats. The unit sports a 2.4-inch color LCD display, and a new capacitive touchpad that SanDisk says provides the convenient feel of using a touchscreen without obscuring the visible display. The devices are available with 4, 8, or 16 GB of built-in memory that can be augmented with microSDHC removable storage for up to 16 GB additional storage. SanDisk says the rechargeable batteries should handle up to 24 hours of audio playback or five hours of video—and the device packs an FM radio if that stored digital content gets too boring. The Fuse+ players are also pre-configured for synchronization with the Rhapsody, Napster, and eMusic services. SanDisk says the Fuse+ MP3 players are available now through retailers, although in-store pricing will be set by those retailers, so $79, $89, and $119 price points are just suggestions.